Adding another highlight to an already crazy 2014, LA&apos;s Kill The Noise is set to embark on the massive 45(!) date "Majestik As Fak" tour later this year. With a schedule like that, you can be pretty sure he&apos;ll be landing in a town near you. 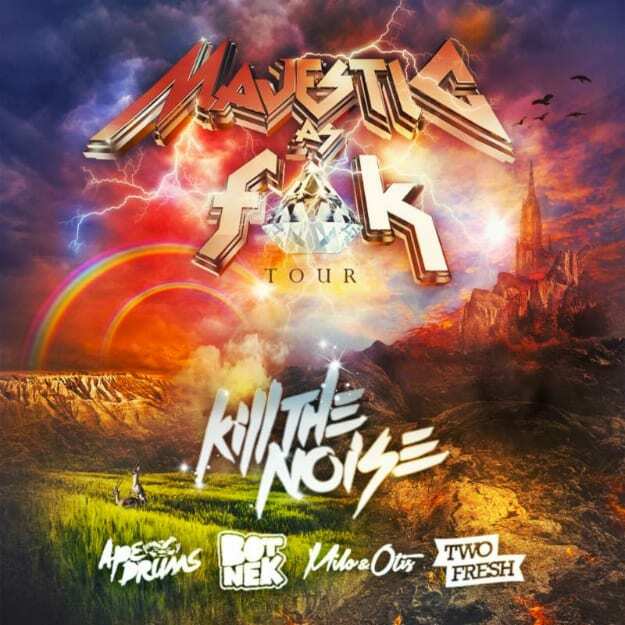 Following block-buster appearances at EDC, Coachella and Lollapalooza, Kill The Noise will be joined by Milo & Otis, Botnek, Ape Drums, and Two Fresh on select dates. Kill The Noise has collaborated with Skrillex and Mat Zo recently, but to me his crowning achievement is obviously partnering with Juicy J Wiz Khalifa and Ty Dolla $ign to make the theme for the new Teenage Mutant Ninja Turtles movie. This puts him in a hallowed group that includes such icons as MC Hammer, Vanilla Ice, and Technotronic. Keep it locked for Majestik As Fak dates.